Product categories of Collar Lace & Lace Motive, we are specialized manufacturers from China, Lace Collar, Vintage Lace Collar suppliers/factory, wholesale high-quality products of Lace Motive R & D and manufacturing, we have the perfect after-sales service and technical support. Look forward to your cooperation! 1. 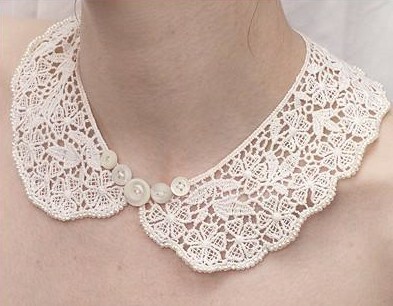 Collar Lace in 100% cotton. Meanwhile, you can call it neck lace or Lace Collar. 2. It is good hand feeling. The feeling can make as per customer need. Polyester is also available. 4. Sample lead time is around 7 days. Sample fee is $5/pc in stock available , if no,$20/style . 5. Bulk lead time: 10-15days generally, but should according to qty, color and our production schedule. 6. 15-30pcs/pp bag or according to customer inquiry. And standard carton with required outside mark . 8. All the laces are made by machine with high quality. Customer design and color would be welcome. Garment, dress, curtains, hometextiles ,etc. AZO FREE, APEO FREE,COLOR FASTEN,MEET OEKO STANDARD.